I love all things retro and 50’s (I’ve done the photo shoot, I own the clothes!) and with fantastic inspiration out there like Grease it’s impossible not to come up with some amazing ideas for your own retro 50’s inspired party. Get your guests to dress in poodle skirts, leather jackets and wayfarers and channel Styled by Belle’s awesome retro milk bar – a classic idea for any classic party! 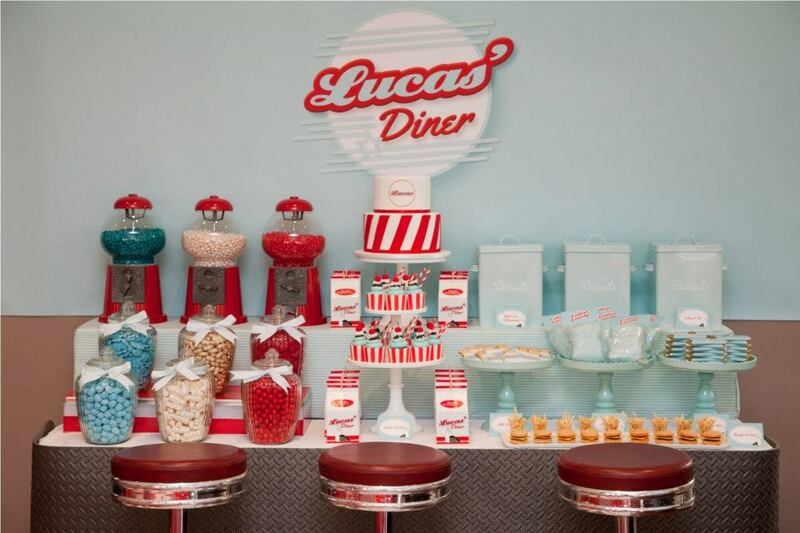 Styled by Belle chose a diner theme for a children’s party, and the idea was to set up a few candy buffet tables full of diner inspired food and drinks. Use neon signs, red plastic bar stools and a black and white titled floor to give guests the feeling that they have walked back in time. Most diners were red and white (I’m not actually sure why – do you know?) 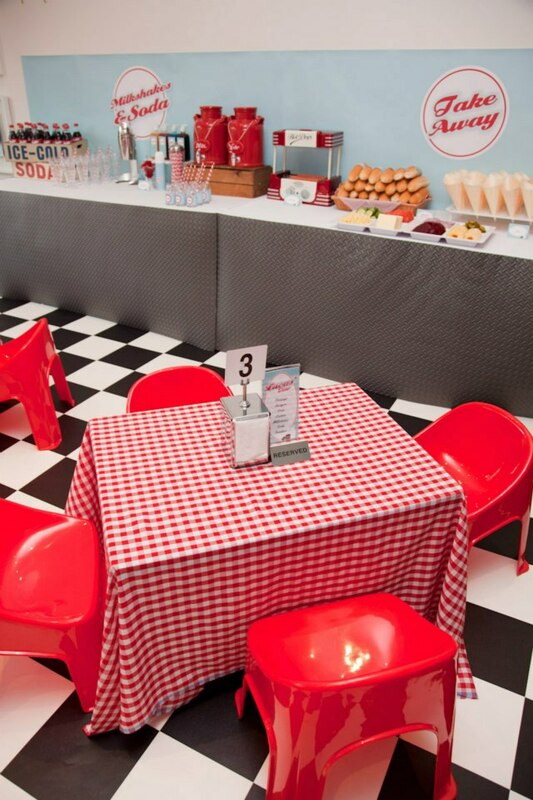 so use some gingham table cloths and red plastic chairs that suit the size of your guests. If you can get your hands on a booth, add that to the vintage style! The candy buffet and food tables are probably the main focus for a retro diner themed party. Use the colours of the classic red and white diner and incorporate it into the food, such as red and white candies, striped cupcake wrappers and a birthday cake. Gumball machines were also set up inside retro 50’s diners, so a big classic red gumball machine would make a great decoration element – and you can get a mini one as a prize for the best dressed! 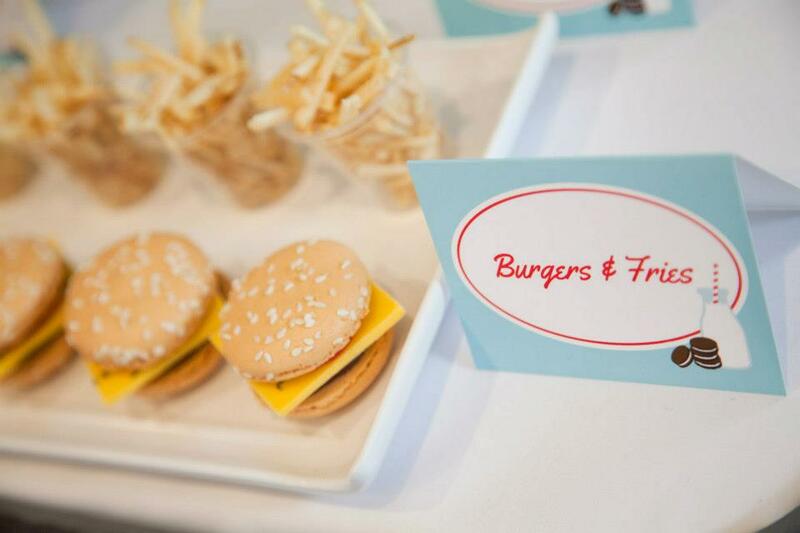 There is nothing more retro than a burger and fries, and you could go the way that Styled by Belle went and make mini macaron burgers (courtesy of Macarahrah) and serve them with plastic shot glasses of the French Fries style potato chips, or you could take a leaf out of the Party Connection’s book and serve cookie fries and cake burgers. A delicious treat all around! If your having a retro style party for your children, you have to have sustenance – or about as much sustenance as diner style food can provide. But hey, it’s a party! 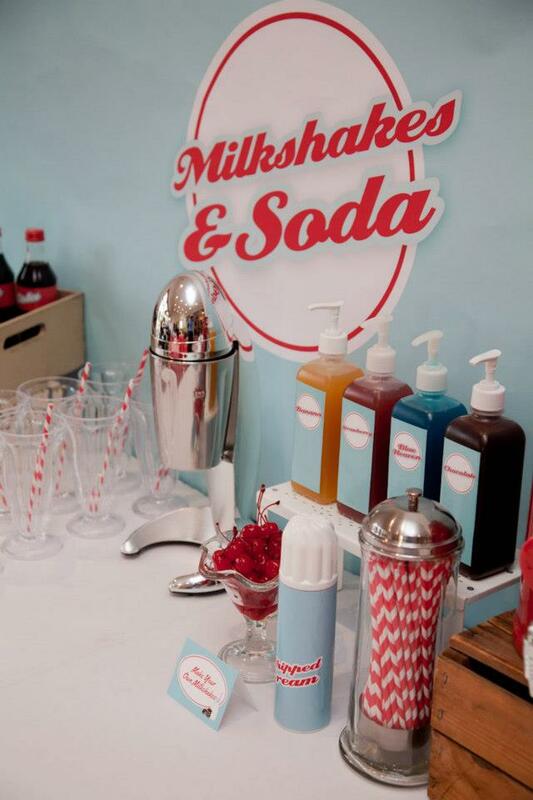 Get a milkshake bar going, with red and white vintage straws, vintage milk bottles, and syrups for your milkshakes (Blue Heaven is a classic!). Set up a sundae bar with toppings and Coca Cola in vintage glass bottles sitting in crates. Have toppings ready for guests to make their own hot dogs and hamburgers and serve them with fries in a little red plastic basket instead of plates. Yum yum! Welcome to the 50’s! Don’t forget to set up a karaoke bar or jukebox for guests to let off some steam on the dance floor!